On Saturday evening, Angela Park gave a piano recital which was prefaced by a performance by one of her students. Ian Chan is a 13 year old who lives near Toronto and had lessons from Park whenever she was home from her duties at Indiana University. Now she is back in the Toronto area the lessons have become more regular. 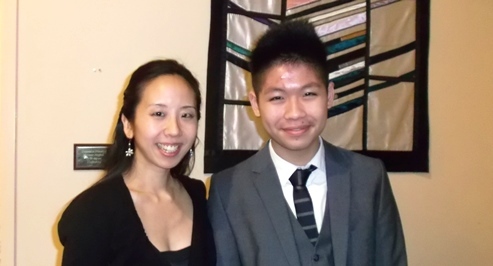 Chan is not just an accomplished pianist; he also won the prestigious RCM Silver Medal for violin and plays percussion in the school band – an extremely talented young man. He chose Pagodes from Estampes by Claude Debussy. Debussy wrote that this piece should be played almost without nuance, which requires great control and patience on the part of the pianist. The colours of the music are meant to wash over the listener so that one gets the impression of the texture of the work. There are hints of Chinese and Japanese music and a definite nod to the Javanese music that so influenced Debussy. Chan played it with an emotional maturity that truly matched the piece, it was impossible to remember he is only 13. I hope we will hear much more from him in future. Angela Park then offered Schumann’s Davidsbundlertanze (Dances of the League of David), a set of 18 piano pieces written shortly after Clara Wieck agreed to be his wife. Park said playing them is like reading his diary – there are rousing, happy ones; rollicking funny ones; introspective and longing pieces; an imposing rather pompous one; and even a wild and lustful piece. This is very emotional, complicated and romantic music masterfully played by Park. It never ceases to amaze me that such a tiny lady can get such a huge sound from a piano. I have heard Park play in duos, trios and quartets frequently and she is an superb ensemble player, but it is also a joy to hear her play solo. She is now very confident of her abilities and obviously enjoys what she does. Park returned after intermission with a contemporary Canadian piece by John Burge. he writes melodic approachable music and in 1996 wrote a piece called Everything Waits for the Lilacs about the longing for spring in Canada. It sounded so much like last winter that you could practically hear the wind whistling though the chords – very evocative. The final offering was Liszt’s, Selections from Annees de Pelerinage, Premiere annee: Suisse which chronicles the composer’s travels through Switzerland. It is in five parts and begins with the powerful and virtuosic Chapelle de Guillaume Tell; followed by the liquid and flowing Au lac de Wallenstadt; and the light and airy Au bord d’une source. Then we are roused by the dark, brooding and loud Orage; and finally the existential crisis of Vallee d’Obermann. Whether dark or light, soft or rousing, this could only have been written by Liszt. It is difficult and complicated and requires stamina to play and yet needs to be handled with understanding and extreme musicianship. Park was easily up to the challenge and it was a privilege to hear.